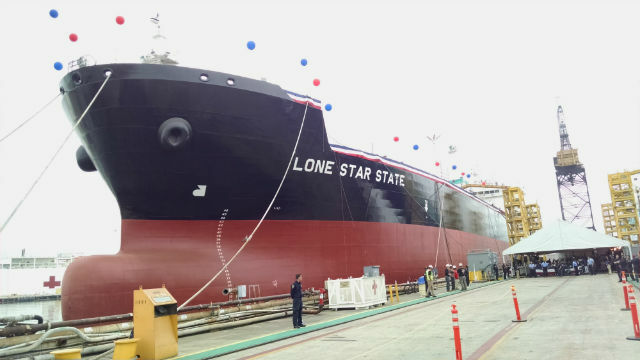 The first of a fleet of five environmentally friendly oil tankers to serve American ports was christened Saturday morning at the General Dynamics NASSCO shipyard in Barrio Logan. The ship’s sponsor, Helen Downs, the wife of Houston shipping executive Tim Downs, broke the traditional bottle of champagne across the hull of the 50,000-ton Lone Star State, which was completed in just 13 months. The 610-foot-long vessel is the first of a fleet of five ships that will carry oil between American ports for American Petroleum Tankers. The ships can be converted to carry liquefied natural gas as well. 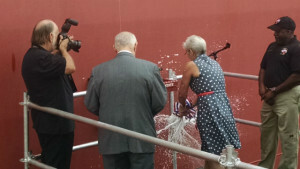 Faulconer’s wife, Katherine, welded her initials onto a steel plate during the traditional keel laying ceremony in March. Many of the ships are being build under the provisions of the Jones Act, a nearly century-old law that requires ships used in commerce between American ports be build by U.S. shipyards and be operated by American crews. The act is intended to ensure a strong U.S. shipbuilding industry for military preparedness. Robert Kurz, president of American Petroleum Tankers, said surging American oil production thanks to the fracking revolution spurred the U.S. industry to produce a new fleet of ships to transport that petroleum. “What you see here today, ladies and gentlemen, is a great example of this cooperative effort,” he said. Fred Harris, president of NASSCO and also General Dynamics’ East Coast-shipyard Bath Iron Works, said the new “ECO” tanker is one of the most fuel efficient ships in the the world, noting that it is a third more efficient than tankers built just five years ago at NASSCO. The ship was designed by a subsidiary of Daewoo Shipbuilding & Marine Engineering in South Korea and uses a German-made diesel engine.